25 Books of 18 Weekly Time Sheets & Copies. Size : 8-1/2" x 5-1/2"
30 days w/15% Restocking Fee & $10 Partial Shipping Reimbursement. 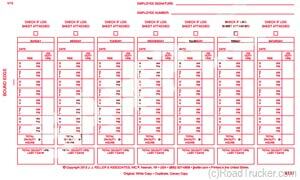 100 Air Mile Radius Carbonless Driver Exemption Logbook allow a simple, concise method of keeping track of hours worked for driver's who meet the requirements of 49 CFR Section 395.1(e)(1), as defined by the FMCSA. Basically CDL drivers who normally would stay within a Radius of about 115 Statute Miles can use these logbooks. In addition, non-CDL drivers who would normally stay within a Radius of about 170 Statute Miles from their home terminal can also use these logbooks.